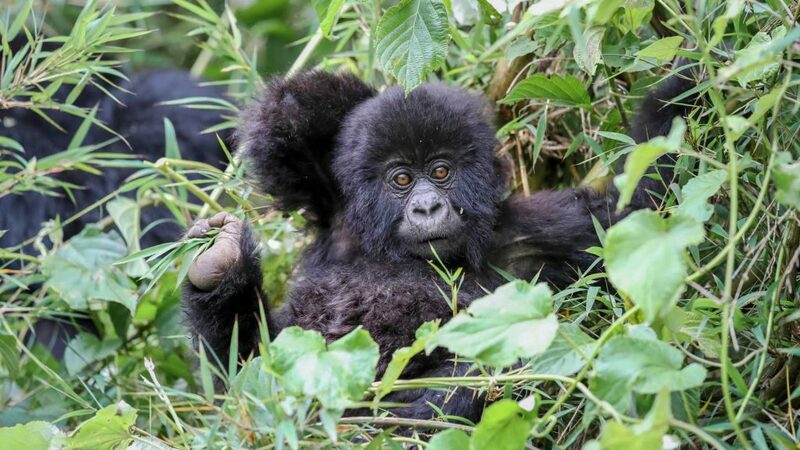 Along with Rwanda and the Democratic Republic of Congo, you have the absolute best area in the world to visit, spot and interact with gorillas and chimpanzees. Permits for this don’t come cheaply, however, but this is a truly once in a lifetime experience. – Lake Nakuru National Park and its lake. Meet local children at the East African Mission Organisation. 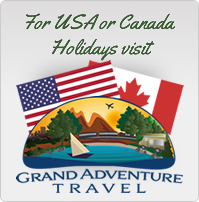 – Gorilla Trekking – optional. Bwindi or Mgahinga Gorilla park in Uganda. – Lake Bunyoni, spectacular scenery. Welcome to Nairobi! We’ll be there to collect you at Nairobi Airport and transfer you to the Kenya Comfort Hotel. Tonight you will stay in shared dorms. There will be a pre departure meeting at 17.00. Nairobi – Masai Mara. Heading west from Nairobi on day 2, we reach possibly Kenya’s most famous natural attraction – the Masai Mara National Reserve. The Kenyan section of the wildly beautiful Serengeti Plains teems with wildlife. The highlight of the Mara is no doubt the annual wildebeest migration, when literally millions of these beasts plus zebra and Thomson’s gazelle stray north from the Serengeti in neighbouring Tanzania in search of lush grass on the savannah plains. Elephant, lion, cheetah, giraffe and a multitude of hooved herbivores also inhabit the reserve. A game drive through the Mara on day 3 gives us the chance to spot the Big Five. During our stay we can also opt to visit a local Masai tribe. Masai Mara – Eldoret. Leaving the Masai Mara early on day 4, we head out of Masai Land and pass through the scenic tea plantations of Kericho before descending the Rift Valley Plateau, on our way to Eldoret – our stop for the night of day 4. Eldoret – Kampala (Uganda). This morning we cross the border into Uganda where we overnight it the capital city, Kampala. Kampala – Lake Bunyoni. 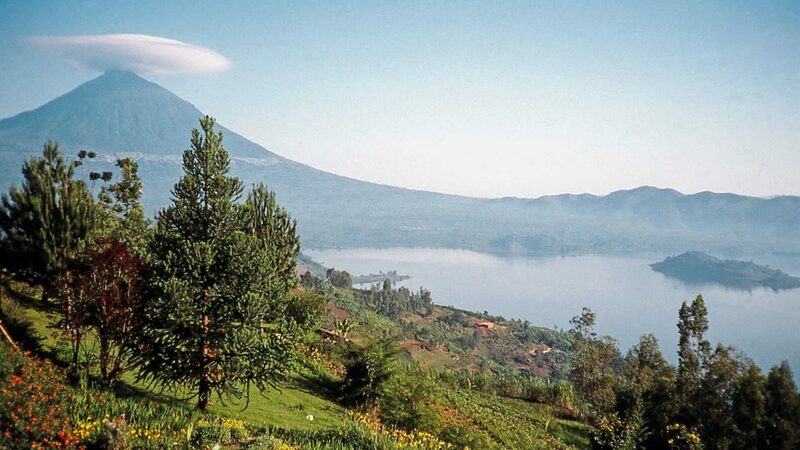 From Kampala we drive to Lake Bunyoni, the deepest Crater Lake in Africa and home to a large and varied number of beautiful birds, which is the base from which the optional Gorilla trek takes place. Dependant on where trekking permits are available, we trek in the Magahinga or Bwindi National Parks in Uganda. Lake Bunyoni – Kampala. After marvelling at the experience of our gorilla encounters and enjoying the peaceful Lake Bunyoni, we begin our drive back to Kampala. We cross the Equator for the second time and stop for the classic “one foot in each hemisphere” photo opportunity. We overnight in Kampala and have the opportunity to sample its night life! Kampala – Jinja. 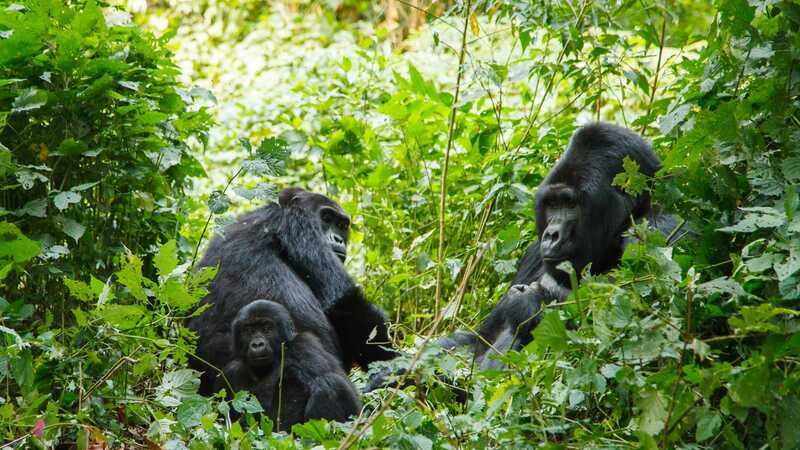 Today we have the option of visiting the Ngamba Island Chimpanzee Sanctuary or heading to Jinja for a selection of adventure activities including white water rafting at the source of the White Nile, quad biking or visiting a volunteer and community project. Spend the afternoon relaxing on the banks of the river, or ticking off the wide variety of water birds in this area. Jinja – Nakuru (Kenya). Departing early, we head back to Kenya and spend the night outside Nakuru at a lovely campsite on a local farm. Nakuru is Kenya’s 4th largest town and capital of the Rift Valley Province and lies adjacent to the small but wildlife rich Lake Nakuru National Park. Lake Nakuru National Park is home to a veritable array of wildlife. The park supports a population of black rhino, lion, leopard, zebra, antelope and giraffe not to mention millions of pink flamingos. The lake itself is a shallow soda lake. The following morning we begin our exploration of the national park and after our game drive, we head back to camp. Saturday. Naivasha – Nairobi. After breakfast today, we head back to Nairobi. On arrival we bid farewell to members of the group.